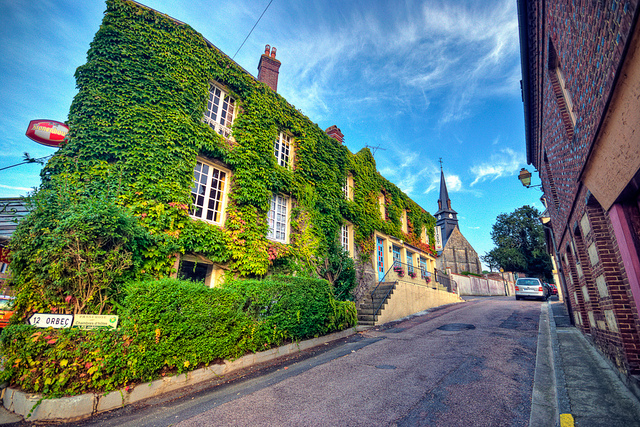 Le Tournebroche is a charming restaurant in the small village of Notre Dame de Courson in the heart of the Valley of the Touques in Normandy, France. 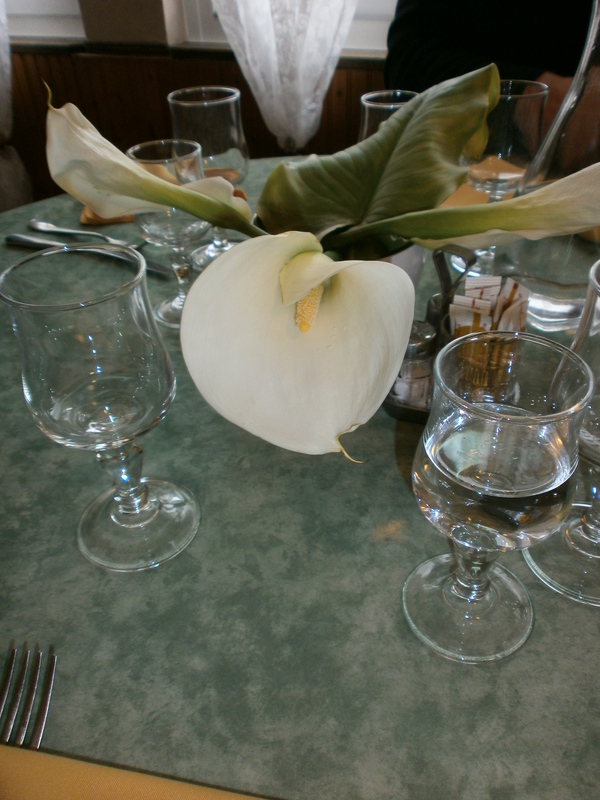 My family have been visiting the area for some 15 years now and on every single visit, we have had a meal at Le Tournebroche – we just can’t get enough of it and keep coming back for more!! The building is massive and looks like it ought to have once been a hotel or guest house however, it has never featured as such in my memory. The interior hasn’t changed much over the last 15 years, nor have the owners or the menus but why change something that works so well? On our most recent visit to the area, my Dad, boyfriend and I popped our head into the bar for a drink on a few occasions and the owner and head chef, Christian Bellanger, came to talk to us. Christian and his wife Martine are always so hospitable and remember us from years gone by…I can’t help but wonder whether that is because our French is so abysmal!! We saved our meal at Le Tournebroche for our last evening in France as, you always save the best till last hey! As it was the end of our holiday, we thought it was only apt to start the evening in true French style with aperitifs. We all chose a ‘Kir Royale’ which is creme de Cassis (blackcurrant liqueur) with champagne. 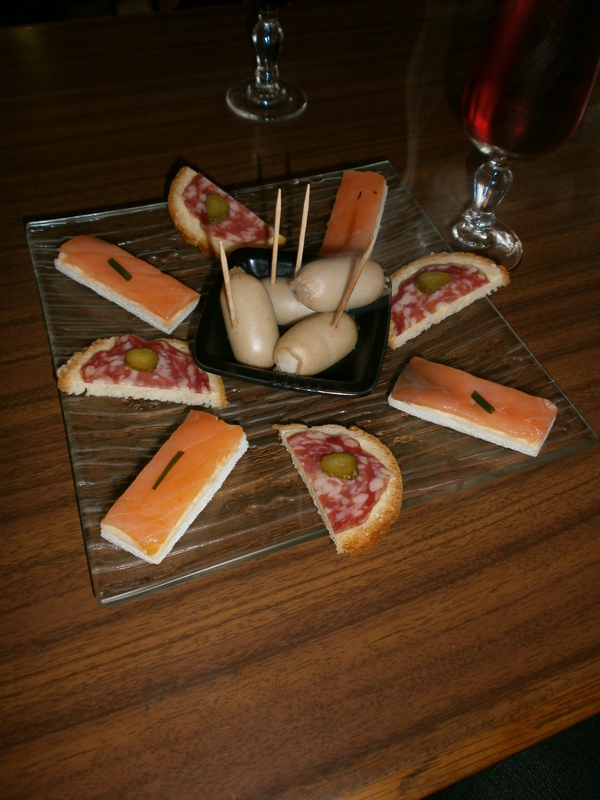 As is quite common in France, we were given a small plate of complimentary nibbles with our drinks; smoked salmon, cured meat and hot sausage. They were all a very welcome start to the evening to get our taste buds tingling! As I’ve mentioned, the menus have not changed much since we have been visiting the restaurant but this is not something that concerns us as there is still a good selection of food on offer and all of the dishes are delicious! 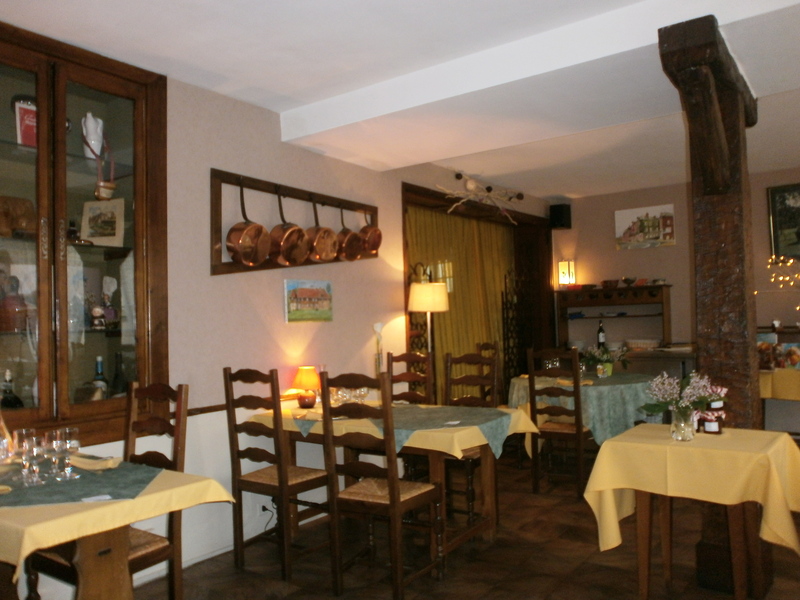 Le Tournebroche, as with most French restaurant, offers a variety of menus at set prices. The cuisine is local but unlike many restaurants in the area that we have visited, it has a modern twist and is presented in a sophisticated style; quite simply it is French cuisine at its best! We all decided to opt for a middle of the range menu at 24 Euros which consisted of a starter, main course, cheese course and dessert. However, we had to start our meal with an added dish to share, especially for my boyfriend’s enjoyment! I adore snails and eat them every time I visit France; I am sure some of you will be turning your noses up in disgust at this very moment but, I assure you, eating snails is simply like eating small lumps of chicken in garlic butter. In fact, I think it is the garlic butter that appeals to me more than anything!! My Dad was insistent that we had to get a dish of 12 escargots to share so that Mr MAC could sample a couple. We all enjoyed the snails although, I think my boyfriend and Mom could take them or leave them whereas I will definitely order them again! 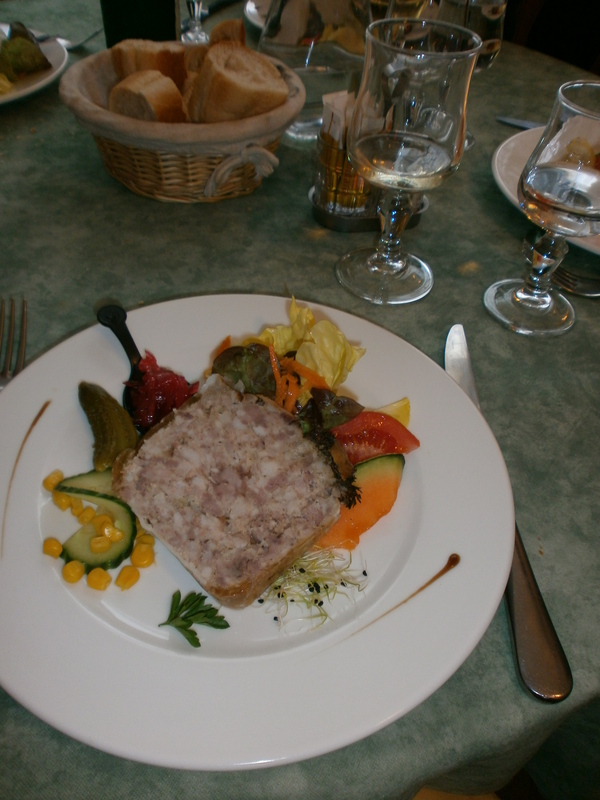 For the starter, Mr MAC and I chose ‘Terrine de Canard maison et sa d’oignons’ (House duck terrine with onion jam). The terrine was lovely, slightly coarse and full of flavour. The jam was bright red but lovely and sweet and the perfect accompaniment. 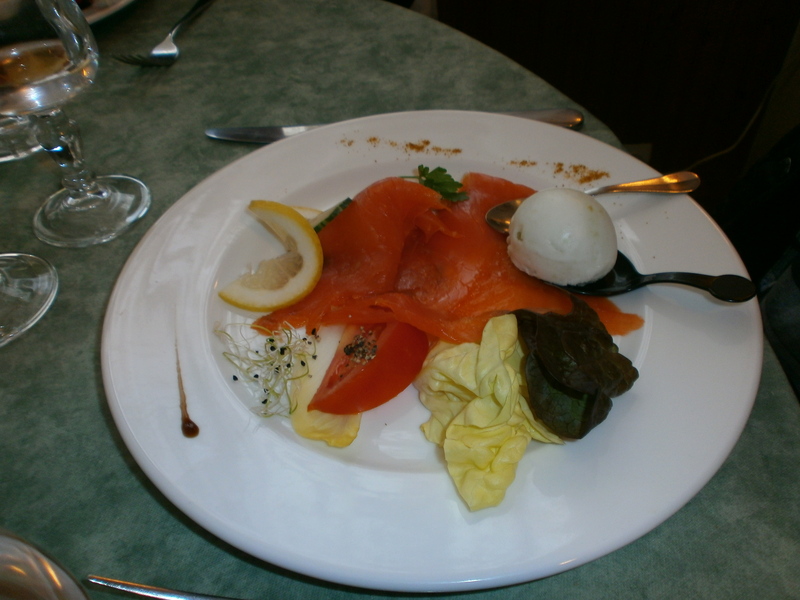 My Mom and Dad both opted for the ‘Truite fumee avec sorbet citron’ (Smoked trout with lemon sorbet). In the next village over, there are trout ponds so the fish was nice and fresh. Again, the dish was nicely presented and delicious! 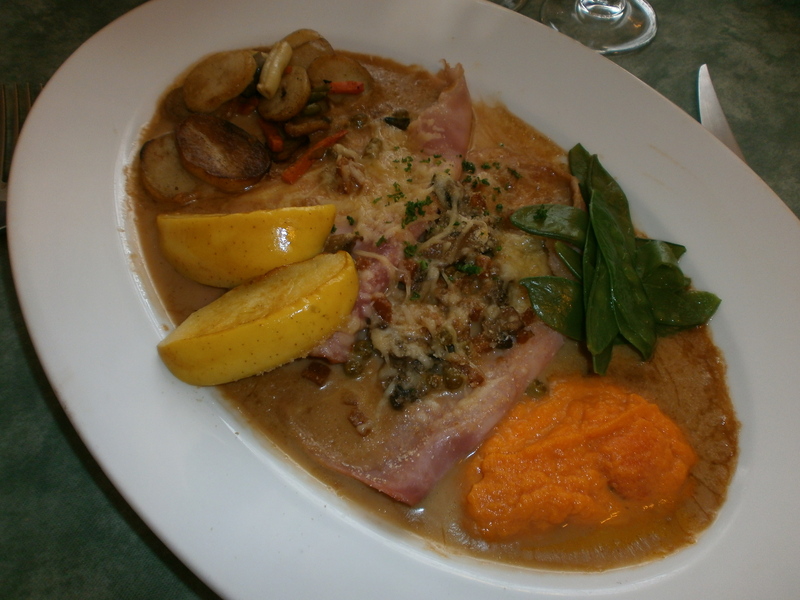 For the main course, none of us could resist ordering the ‘Jambon Braise Vallee d’Auge’ (Braised ham in Valley D’Auge sauce); my Mom, Dad and I have all eaten this dish before and adore it! 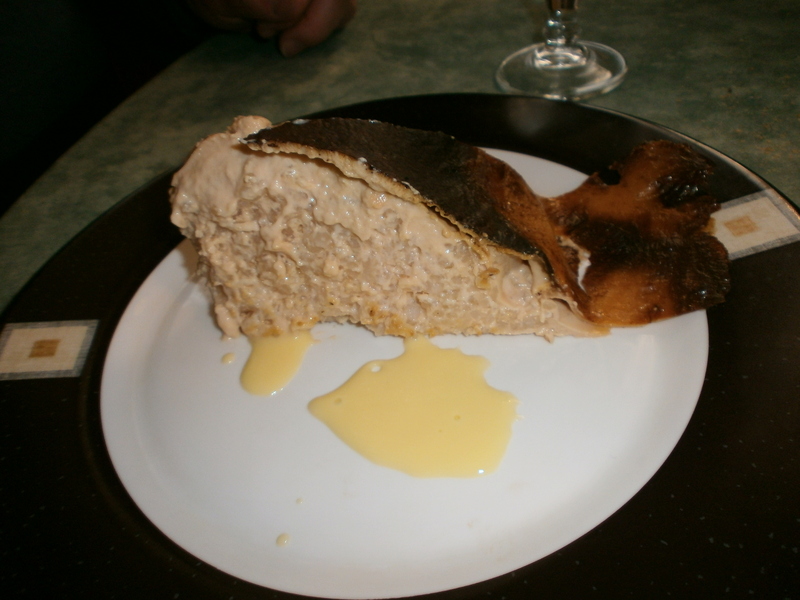 Vallee d’Auge sauce is basically a creamy sauce featuring apples and calvados and can be found in many restaurants across the region. We all throughly enjoyed the dish and all commented on how generous the portion was! We were all rather full by this point and although, there was wonderful local cheeses on offer we were all very circumspect and had a small slice each as we wanted to have room for dessert! My Dad absolutely adores rice pudding; he always seems to crave traditional ‘stodgy’ desserts therefore, the only option for him was ‘Teurgoule’, Normandy’s version of rice pudding. Although I think it doesn’t look that appealing, he says it is excellent and would thoroughly recommend it. 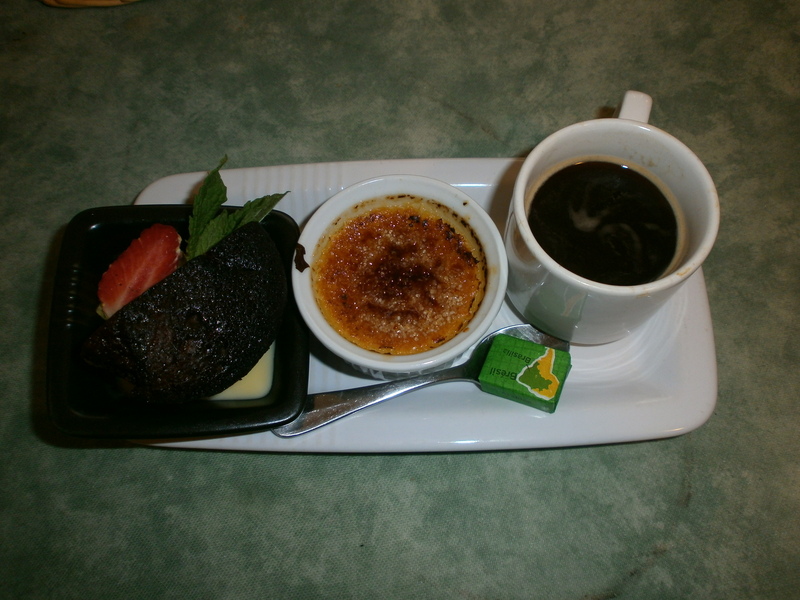 I am a complete chocaholic but I also have really enjoyed Le Tournebroche’s creme brulee in the past so, I decided upon ‘Cafe Gourmand – Moelleux au chocolat et mini creme brulee’ (Espresso, chocolate lava cake and a mini creme brulee). The espresso was the pick me up I needed and the creme brulee had the perfect crunch; something that I cannot stand is a soggy creme brulee! Unfortunately, the chocolate lava cake was a tiny bit overdone but still very tasty. My Mom and boyfriend chose Creme Brulee; a very good choice. The desserts are always excellent at Le Tournebroche, in particular the Creme Brulee. Mr MACl really enjoyed his experience of this dessert. Of course we also had a few drinks with dinner. My Mom, Dad and I had a lovely bottle (or two!) of very reasonably priced muscadet whereas my other half stuck to the local cidre. All in all, a wonderful meal with fantastic. I would certainly recommend paying Le Tournebroche a visit if you are in the area, we certainly will be returning there sometime in the future! 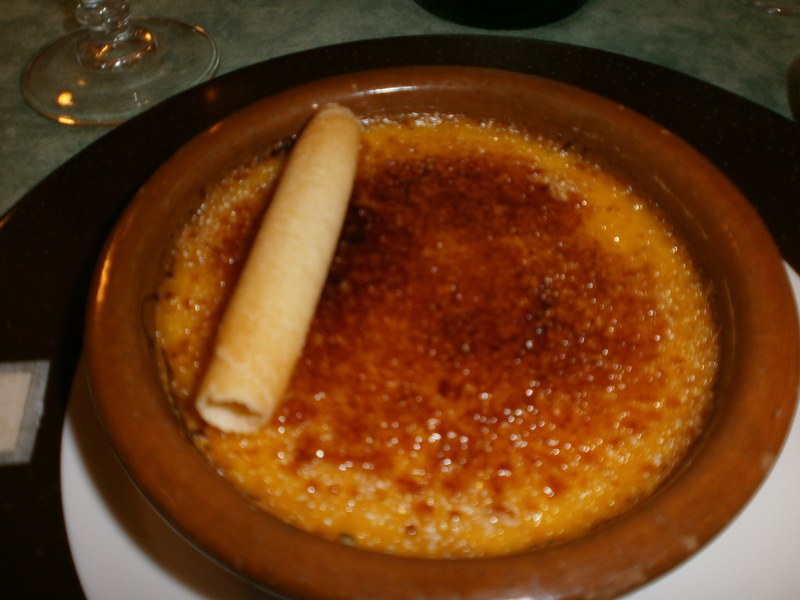 And now for a recipe for Creme Brulee from ‘The Food of France’ (Murdoch Books recipes by Maria Villegas and Sarah Randell). 1. Preheat the oven to 120 degrees. Put the cream, millk, half the sugar in a saucepan with the vanilla pod. Bring just to the boil. 3. Ladel into eight 125ml ramekins and place in a roasting tin. Pour enough hot water into the tin to come up half way up the sides of the ramekins. Cook for 1.5 hours or untill set in the centre. Cool and put in the fridge until ready to serve. 4. Just before serving, sprinkle the tops with the rest of the sugar and caramelise under a v hot grill or with a blow torch.